Here’s my brother-in-law and niece on the San Diego town website. Here’s another one of her with Curious George. The picture at the Library of Yucan and Enna reading reminds me of many things. One, the wonderful start Enna will have in life, with her love of books and two terrific, involved parents. Two, how books were often my refuge in a childhood that was less predictable and less idyllic. On the occasion of my own niece’s and nephew’s birthdays yesterday, I dragged out old photos of them. Lots of pictures of us reading books. Patting the bunny and counting red fish, blue fish, etc. Reading became a way for me to see other possibilities when I was a child. Books gave me a chance to imagine different worlds, whether they were in Hobbit shires, rabbit warrens, outer space, or in fictional families different from mine in some other, but important way. I learned about coral reef habitats and scuba diving and vowed some day, I’d learn to do it so I could exist if only for a moment, hovering weightless among the bright schools of fishes. I’ve seldom been happier than on those dives. I learned about words themselves. I can remember the two large volumes of our household dictionary A-L and L-Z. I thought these two volumes were grand and they seldom disappointed me. When I saw a massive single volume on its own piece of furniture (was it an OED, perhaps?) at a friend’s house. Wow, “Someday.” I thought. Those books had heft, they smelled good, and you could trust them. Good qualities for any of us, come to think of it. Will Wiki be the same for Enna? I can’t imagine it. I developed a love of language when I found out about French cooking, having found my father’s copy of “Mastering the Art of French Cooking” in the closet, under the stairs. I also found old, odd books of his elsewhere. If there were no books in the house, what would my dreams have been? How might my life have been different? Who can say. Just in case I’m right, and books really do make a difference, pick one up and read it today. Read one to a kid. Tell someone about a story you once read that changed your view or maybe your life. Growing up reading was my escape and refuge too. I have fond memories of Caleb practicing on the piano and me curling up underneath the piano with three things: my baby blanket, a blanket and a good book. I’d sped the whole practice session there and often even fall asleep. I remember in sixth grade my mom was called in for a parent-teacher conference and prior to the meeting she scolded me for a gazillion possibilities as to the nature of this meeting. Apparently I would quickly start and finish the class assignments while the teacher was still going over the instruction and directions just so I could pull out a book to read when he gave the class a block of time to work. 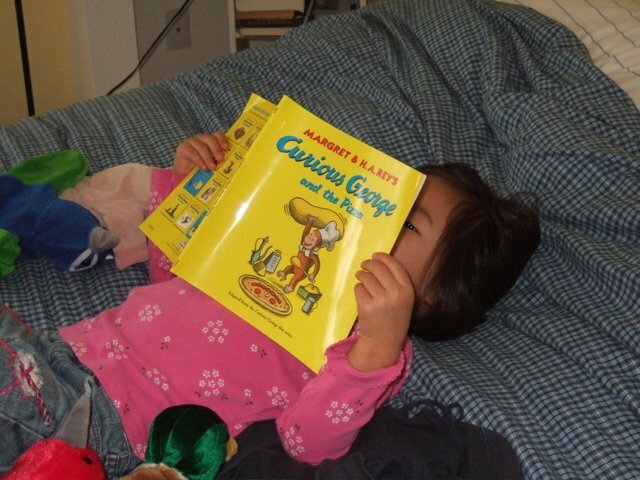 Enna has learned the phrase “designated reader” from watching her one of two PBS kids phonics shows. Yucan and I are her official designated readers! I hope my girls will always love reading.